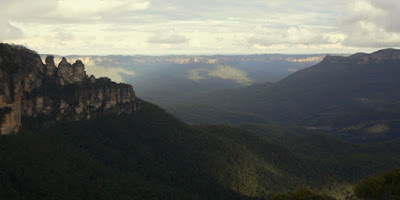 Today, Monday April, 9th, we took a trip to Katoomba in the Blue Mountains. The train ride there is about 1 hour and 30 to 45 minutes. The day started out a little cloudy and foggy as we neared Katoomba. I guess the most famous landmark there is the Three Sisters. 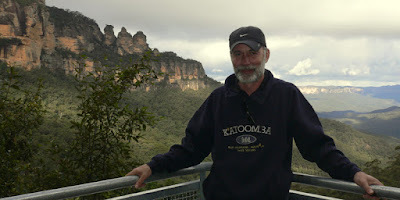 Here I am wearing my Katoomba sweatshirt with the Three Sisters in the background. Here’s another shot of the Three Sisters. This area was the home of the Katoomba Coal Mine at one time. We took the railway, something like a roller coaster train, into the valley where there is a rainforest. 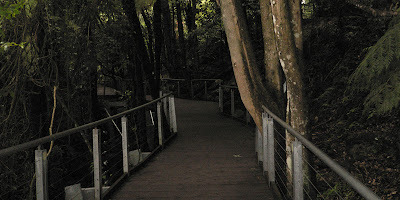 There is an elevated boardwalk, about 2 kilometers long, at the bottom. These are some shots down in the rain forest. There are tree ferns, eucalypts and gum trees here. This place has a Jurassic look to it. Somewhere in this area there are Eastern Grey Kangaroos and Swamp Wallabies but I didn’t see one. I did see a lot of birds, some very pretty parrots. 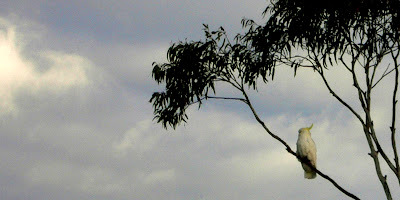 Here’s a lone Sulfur Crested Cockatoo. I’m still hoping to see a kangaroo while I’m here and be lucky enough to get a picture of it. 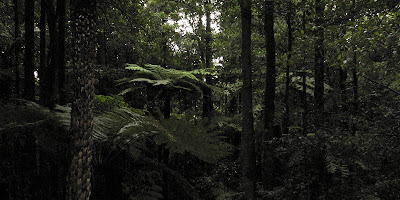 Nice Photos, I hope the rainforest can be permanent life.